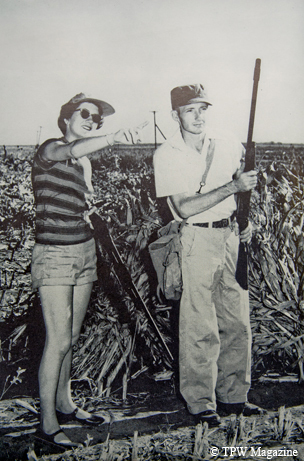 ﻿﻿﻿﻿﻿﻿﻿A quick history of dove hunting in Texas. ﻿﻿﻿﻿﻿﻿﻿﻿Throughout most of the 18th and 19th centuries, explorers and pioneer settlers found Texas to be a hunting and fishing paradise. Anyone browsing early accounts of travel in Texas, dating back as far as Spanish colonial times, will find effusive accounts of buffalo hunting, bear hunting, deer hunting, pronghorn hunting, turkey hunting, duck hunting, quail hunting and fishing. But all these recollections, from correspondence and official reports to diaries and travel­ogues, are silent when it comes to hunting dove. 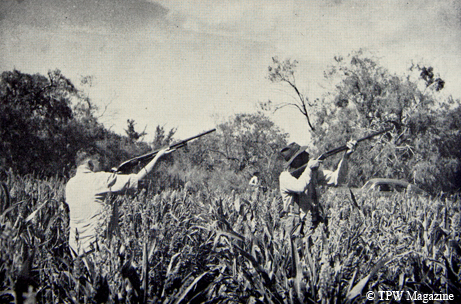 The most logical theory about the scarcity of early Texas dove hunting accounts is that there was so much bigger game available that hunters must not have cared to fool with the small, migratory species. Turkey, duck, geese, quail, prairie-chickens and pigeons existed in abundance and made bigger targets than dove. In addition, turkey, quail and prairie-chicken provided white meat. While initially not a particularly popular game animal, the dove has been around for a long time. According to Thomas S. Baskett’s 1993 book, Ecology and Management of Mourning Dove, fossilized dove remains have been found in North and South American Pleistocene deposits dating back 1.8 million years. Evidence that dove later graced the menu of prehistoric human residents in the Southwest also has been found, including an ancient bone excavated in 1967 at an archaeological site in Llano County. While the earliest Texans may have enjoyed the occasional dove caught in a snare or hit with rocks, when Europeans took interest in this part of the world, they focused on turkey and quail. Dove did play a crucial (if little-known) role in one milestone event of Texas history. When Texas Ranger Capt. John R. Baylor and his men searched the Diablo Mountains in the Trans-Pecos for a band of Apaches in January 1881, they found the tribe after noticing low-flying doves obviously headed toward water. Knowing the Apaches likely would be camped near water, the Rangers followed the birds. Sure enough, they surprised the Apaches as they cooked their breakfast and prevailed in what later came to be recognized as the last-ever encounter between Rangers and American Indians in Texas. At the same time that most of Texas’ Indians were disappearing, many game species were being virtually hunted out. Before dove hunting became popular, pigeons were considered game. Long­time Texas outdoor writer L.A. Wilke once recalled how he used to shoot pigeons around Austin as a young boy in the early 1900s and bring them home to his mother so she could cook pigeon pie for the family. (Back during the national financial panic of 1906–07, they also ate opossum.) Who knows? Wilke’s mother’s pigeon pie may have played a role in the unfortunate extinction of the passenger pigeon. That environmental disaster does get credit in at least one account for stimulating interest in dove hunting. A decrease in quail numbers in the latter days of the 19th century may also have been a factor. In the 1890s, with the passenger pigeon on its way to extinction, Texas hunters finally turned to dove. On Aug. 21, 1895, the San Antonio Light reported that “some dove hunters braved the heat yesterday afternoon for a little shooting but were not quite as well-rewarded as they expected.” Two years later the Light noted that a “party of gentlemen” had killed some 80 doves on Salado Creek, where the road to Austin crossed it. Though Texas had few game wardens to enforce it, the bag limit for dove stood at 15 birds in a season that initially started in mid-July. In time, Sept. 1 became the opening day, though in 1908 the dove season was pushed from the beginning of September to Nov. 1. Basically, the Game, Fish and Oyster Commission believed that dove hunters were also killing quail in September and October, though they could not be taken legally until November. While the beginning of the season eventually reverted to its traditional Sept. 1 date (though for a while it extended all the way to March 1), whether dove hunters had an adverse impact on quail remained a matter of debate for years. Not only was quail hunting still more popular than dove hunting, there’s evidence of some prejudice against dove. Clearly, even in the early 1900s, quail remained the game bird of choice in Texas. Wilke said that when his family moved from Austin to Ballinger for a time, his father always had a shotgun with him when he rode anywhere in his buggy. His father was a Runnels County deputy sheriff, but he toted the scattergun primarily for birds. He shot quail first, dove second to help feed the family. Wilke likely was one of the hunters who took to the fields around the Alamo City on opening day in 1920. The Light reported the following day that shooting had started at sunup “and the dove population of the section was reduced materially, although, according to hunters, not noticeably.” A recent rain had filled area water holes, concentrating the birds. San Antonio hunter C.B. Kilpatrick got his 15-bird limit quickly, showing up at a local sporting goods store at 7:05 a.m. to win a first prize of 100 free shotgun shells for bringing in the first limit. The next hunter with a limit showed up at 7:30, followed by another at 7:45. Eventually, Sept. 1 came to be accepted as the best time to begin harvesting doves, and the limit dropped to 10. The length of the season continued to shrink, moving from Dec. 15 to the end of October. The next big change in dove hunting came in 1935 when a federal statute prohibited having more than three shells in a shotgun when hunting migratory birds. No matter the number of shells they had in their gun, hunters could shoot from daylight to sunset until 1950, when it became unlawful to hunt dove before noon. That held until 1977, when it again became legal to hunt in the morning. The last major change came in 2009, when Texas went to a 15-bird limit in all zones. These days, of course, hundreds of thousands of Texans take to the milo and sunflower fields every September to blast away at both mourning and white-winged doves, which have expanded their range greatly since the old days, when they were legal to hunt only in the Rio Grande Valley. Pigeons (except for the extinct passenger pigeon) are still plentiful, especially in urban areas, but pigeon pie is a thing of the past.